A line from one of my favorite books, “It was the best of times, it was the worst of times” pretty much sums up the fishing this week in Fort Lauderdale. We had some awesome trips where we hit wahoo, mahi-mahi or some big fish off the wrecks and we had some trips where we couldn’t get a bite no matter what we tried. The good news is that the fish are out there, they just aren’t making it easy on us. Dolphin are showing up offshore, in approx 500-600ft of water. That’s only a couple miles off our coast, so you don’t need to go super far offshore to find them. It’s best to go trolling for them as you can cover a lot more ground on the move with your lures out. Our trip yesterday was trolling and found some frigate birds flying overhead. They hit a nice school of mahi-mahi and ended up with a great catch. A few big wahoo were also caught this week. We catch them trolling as well, usually on our deep planer baits. Wahoo love deep trolled lures. This is a good month for wahoo in South Florida, as you can catch them at just about any place and at any time. You just need to run over them. 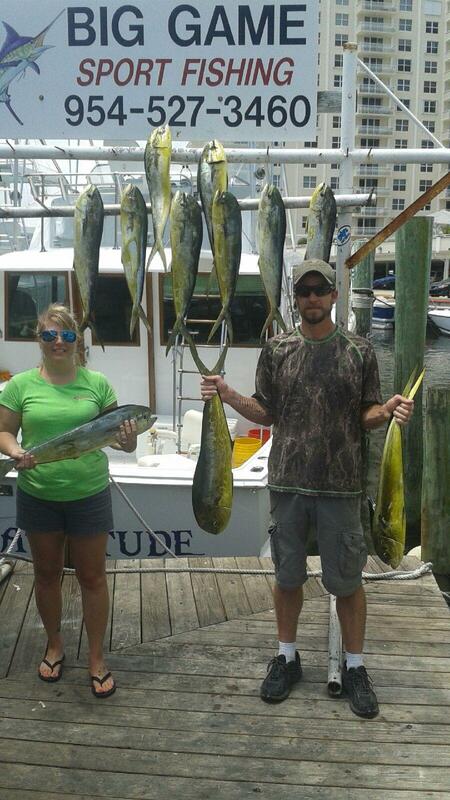 Nice catch of mahi-mahi on our sportfishing charter. Tunas are also biting very good. They are mostly the small to medium sized tunas, but sometimes a big one takes the bait. They are all keepers though and excellent eating size. We had a fishing charter on our higher capacity vessel, the Mary B III and they caught a ton of blackfin tunas, one big blackfin tuna and about 20 big, fat vermillion snappers. Not a bad catch! Tunas are popping up on the reefs, especially in the afternoons. We find them busting small baitfish on the surface and you can see a field of splashes on the top of the water where they are feeding. We troll around these fields of tuna with some natural feathers and small, streamline lures for the best results, and we can usually catch a nice bunch of them before we spook the school and they disappear. Wrecks are holding some nice fish too. Some big amberjacks are showing up on our 200-300ft deep shipwrecks as they always do this time of year. 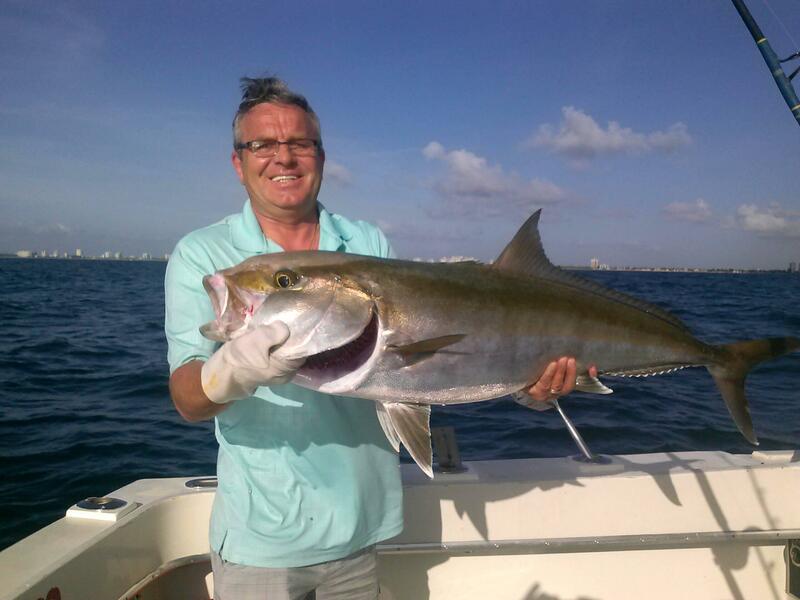 This is the month of the amberjack’s migration through south Florida as they congregate around the wrecks to feed on the abundance of small fish that also congregate on the wrecks. I’m not sure where they go after they move through our waters, but they will be here through the end of June and then disappear. Groupers, cobia, snapper and tilefish are also biting good around these shipwrecks. When we can’t find anything trolling, hitting the wrecks is a good, high-percentage way to put fish in the boat. To sum it all up, there is some good fishing out there but the fish are not making it easy on us. You just have to fish hard and put in the time. Good luck to everyone fishing this week with us. I’ll sea ya on the water. 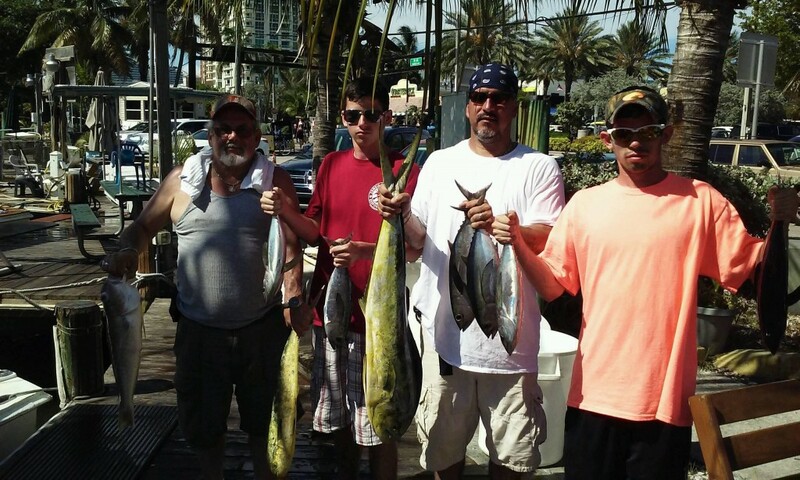 We’re having an excellent week of fishing on our sportfishing and drift fishing trips. There are a lot of species out there biting and some big fish to be caught. Of course, every day is different so not every day is a banner day, but this is definitely one of our best times of year for fishing. First off, dolphin are out there and biting good. Trolling is a great way to go after dolphin as you can cover a lot of ground dragging lures around. We can try different depths, different fishing areas and look around for activity such as birds or fish busting on the surface. This week, scattered dolphin are biting just outside the reef and tunas are also popping up and mixed in with our catches. 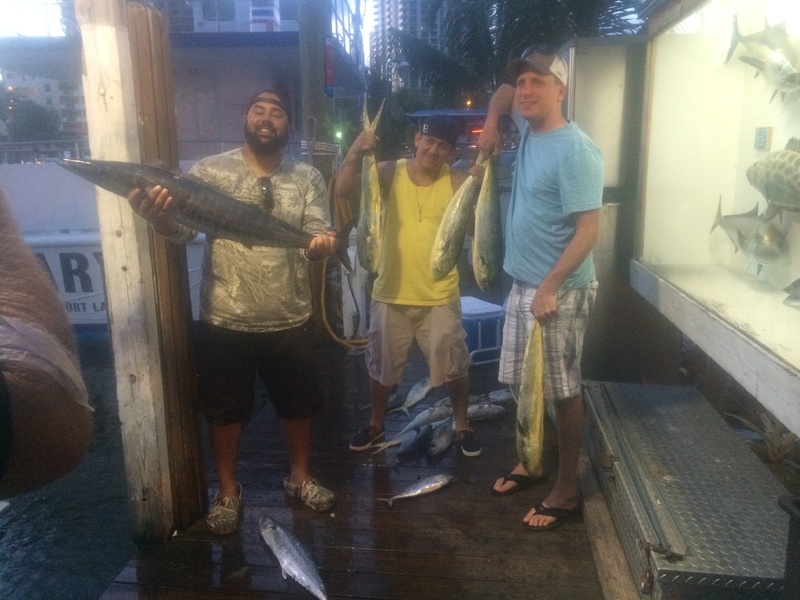 Yesterday we had Greg and his friends out fishing and caught a whole bunch of mahi-mahi dolphin, some tunas and a nice wahoo! A few nice wahoo are hitting the docks this week. Some kingfish are also showing up on the reef, a VERY welcome sign. 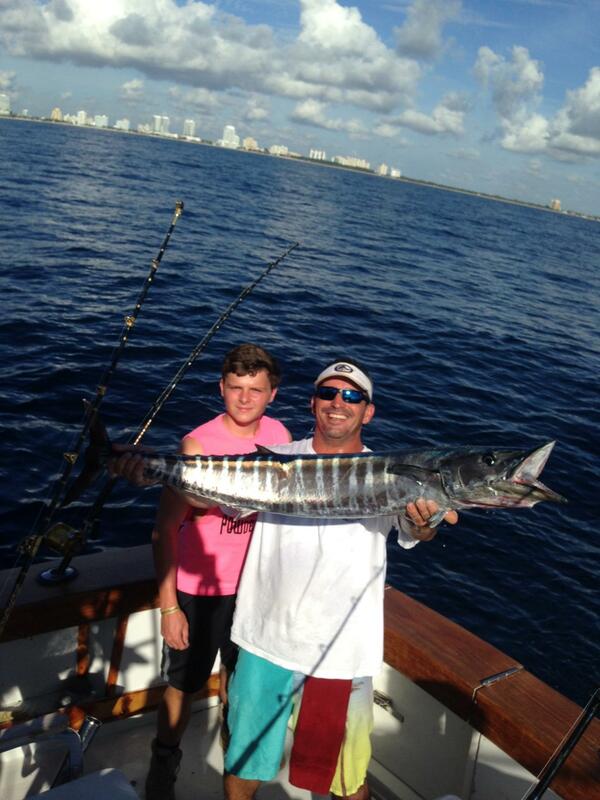 This year, kingfish have been unusually slow for us off the Fort Lauderdale coast. Kingfish are one of our “bread and butter” fish that make up a good portion of our catches. 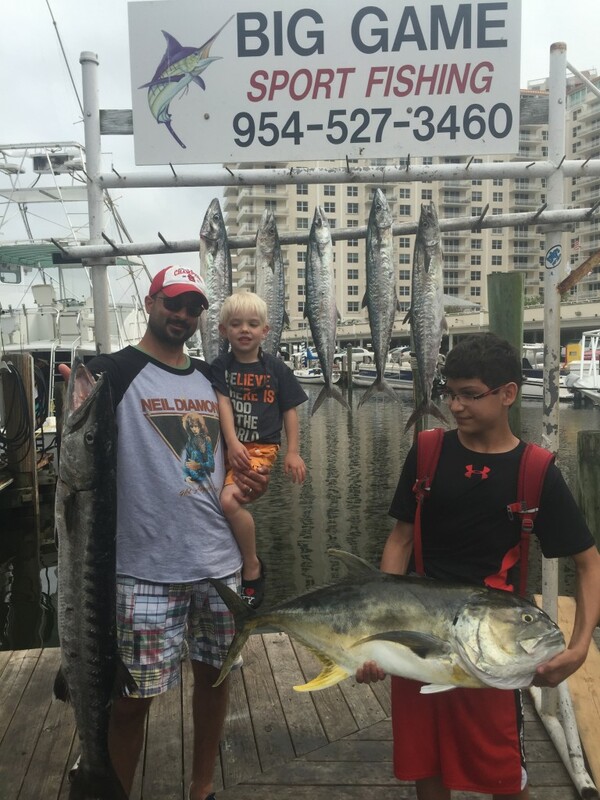 Well, over the past 2 weeks, we’re seeing more and more kingfish biting. We’re happy to see them and we’re targeting them more and more on our drift and sport fishing trips. On the trip in the above photo, we started off trolling for kingfish on the reef and later came into the Intracoastal and did some inshore fishing where we caught that giant barracuda and jack crevale. Sweet catch! Bottom fishing around the shipwrecks has also been very productive. This is the time of year the big amberjacks take over our local shipwrecks in a big way. 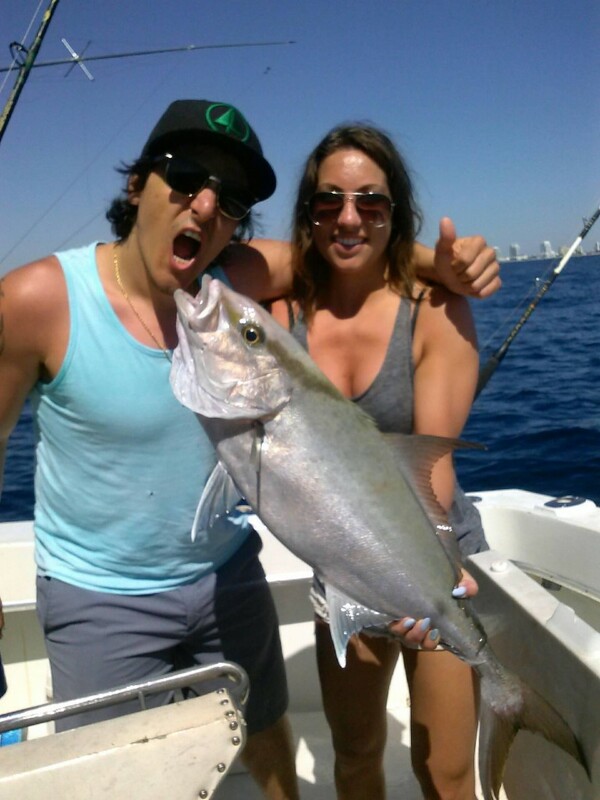 Amberjacks are very aggressive and pounce on a bait seconds of within it coming into their view. Amberjacks don’t let a live bait swim next to them for very long. Besides amberjacks, we also catch some other very nice species on the bottom around these underwater structures. Almaco jacks, groupers and cobia also inhabit these deep wrecks. Shipwrecks are great artificial reefs which hold some pretty big game fish and make for excellent fishing spots. 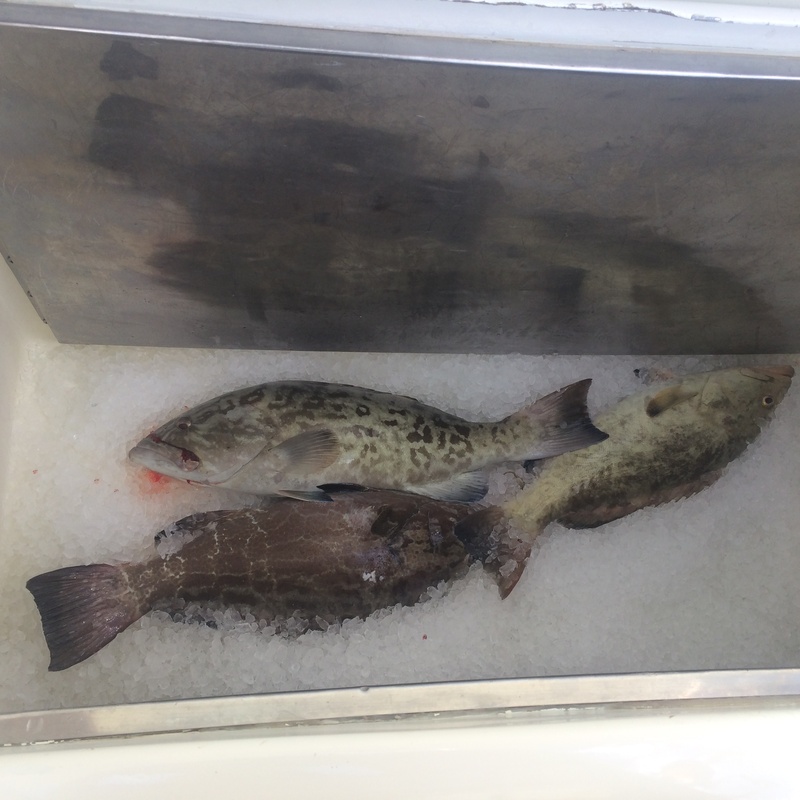 Groupers just came into season last week after a 4 month closure. Also cobia are showing up this time of year and are a very fun fish to catch. You’ll see us catching a lot of various bottom fish species over the next couple months. Thank you to everyone who has fished with us this week and good luck to everyone fishing with us in our upcoming trips. Good luck and I’ll sea ya on the water! 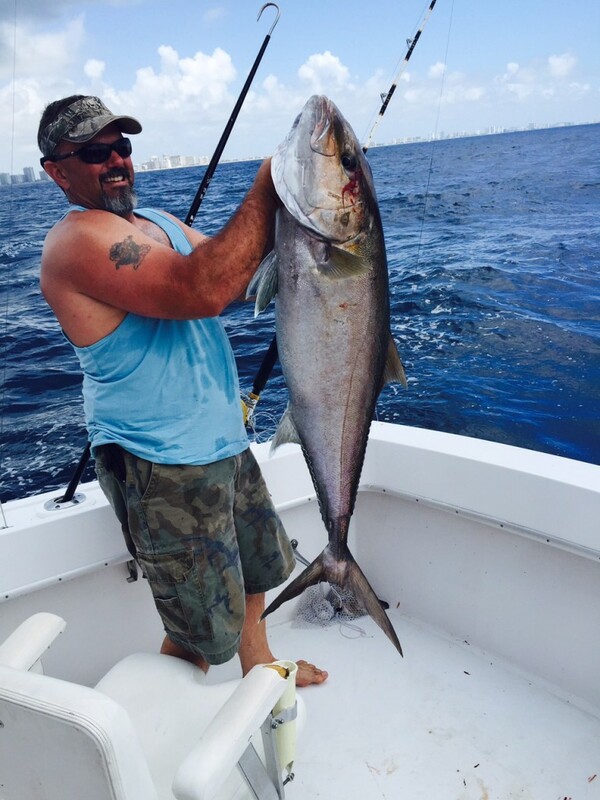 Nice almaco jack caught fishing a deep shipwreck in Fort Lauderdale. 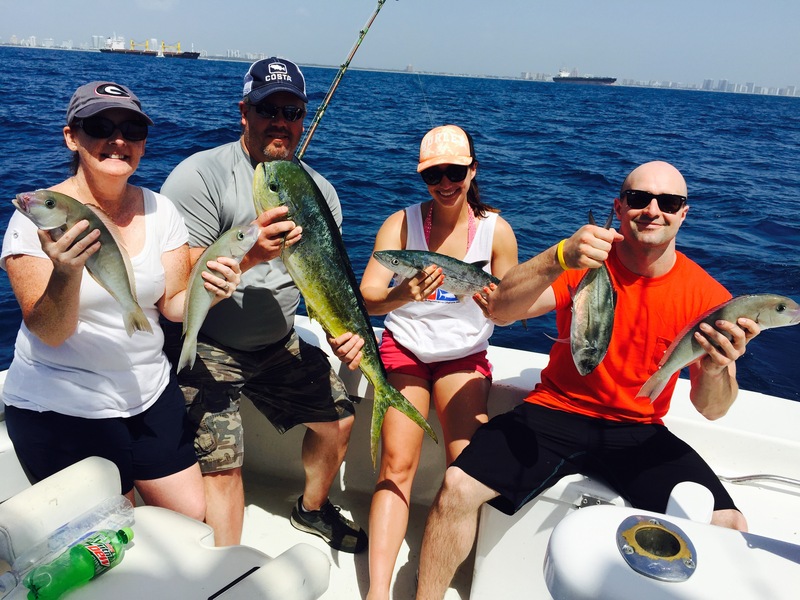 Nice colorful catch of mixed fish on our sportfishing trip. 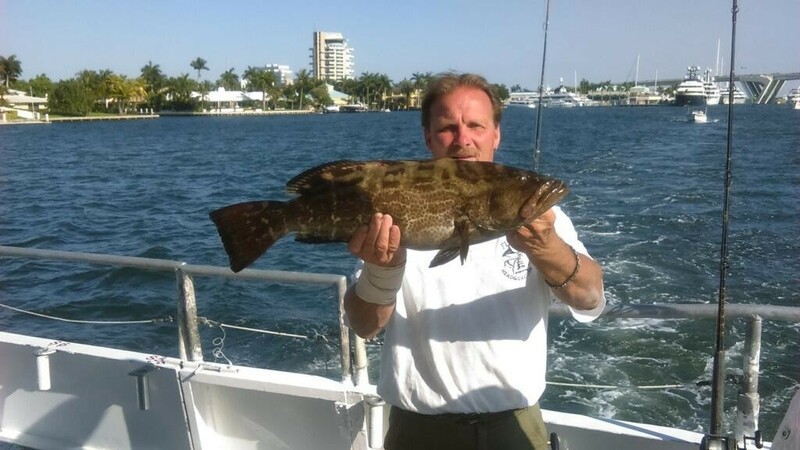 The grouper season started up this week on May 1 and there are some good catches of groupers already hitting the dock in Fort Lauderdale. Reds, blacks and gag groupers are biting on the reefs and wrecks, just a mile off our coast. We’re catching them mostly on our drift fishing trips and night anchor fishing trips, both trips which concentrate on bottom fishing. Squid chunks work well, as do sardines and ballyhoo. 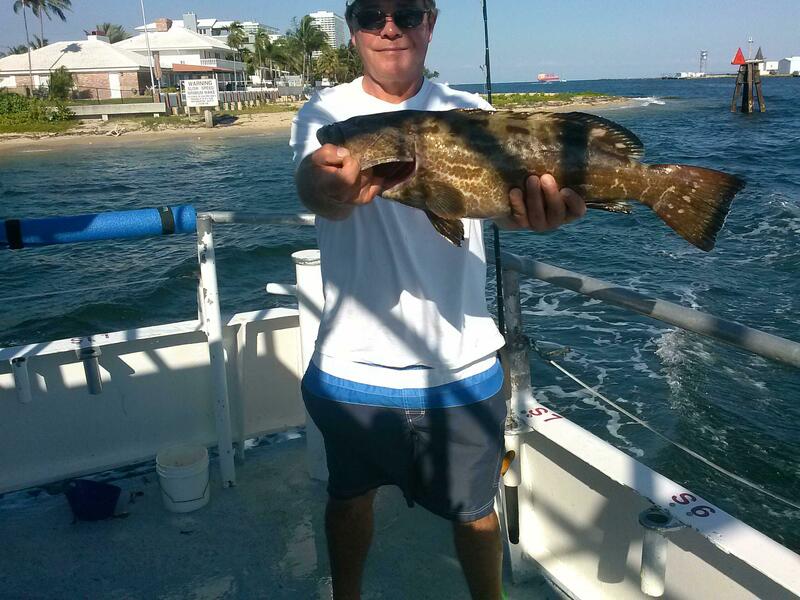 May and June are traditionally 2 of the best months for grouper action. And while grouper fishing, you’re also in prime area for mangrove and mutton snappers. 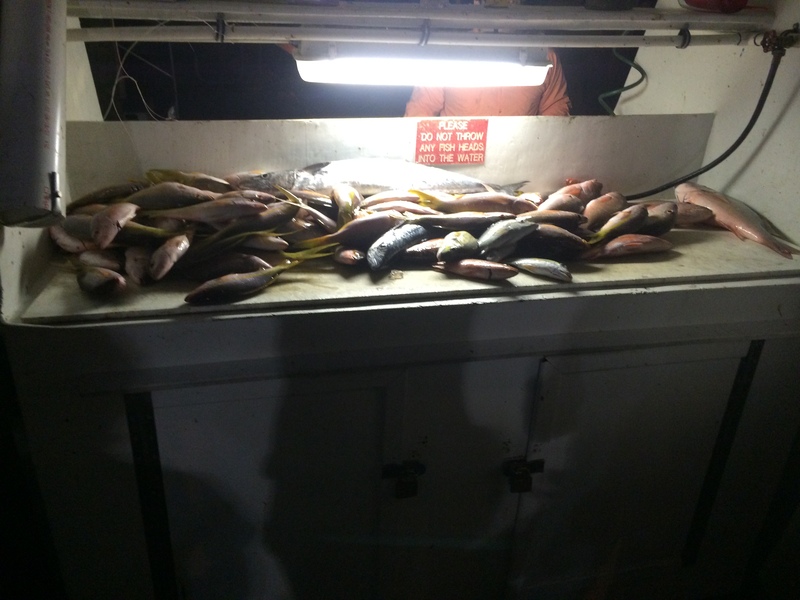 Our night anchor trips have been crushing the snappers this week. Yellowtail snapper are biting excellent and there’s good numbers of mangroves and muttons too. 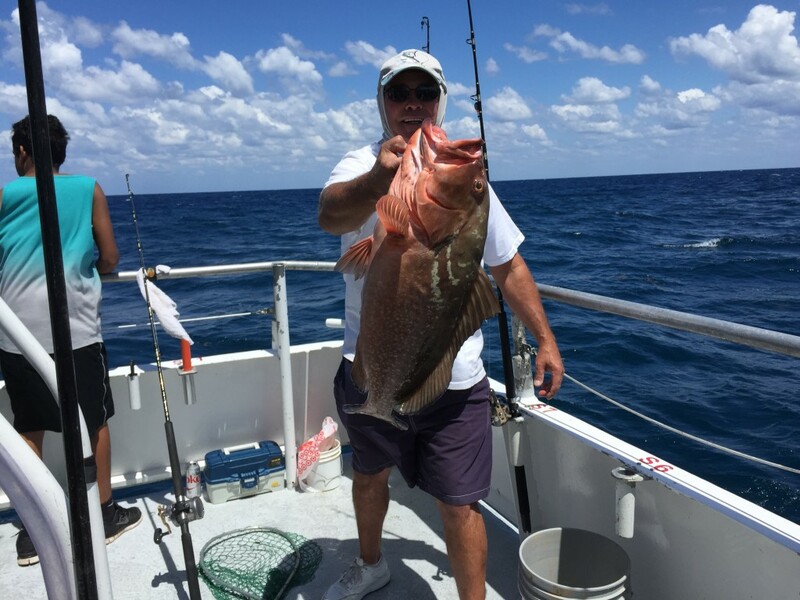 On our sportfishing charters, we’re actually catching groupers well on the troll. Wreck fishing is traditionally the best method to catch groupers, but trolling is working well these days as you can cover a lot of ground on the troll. 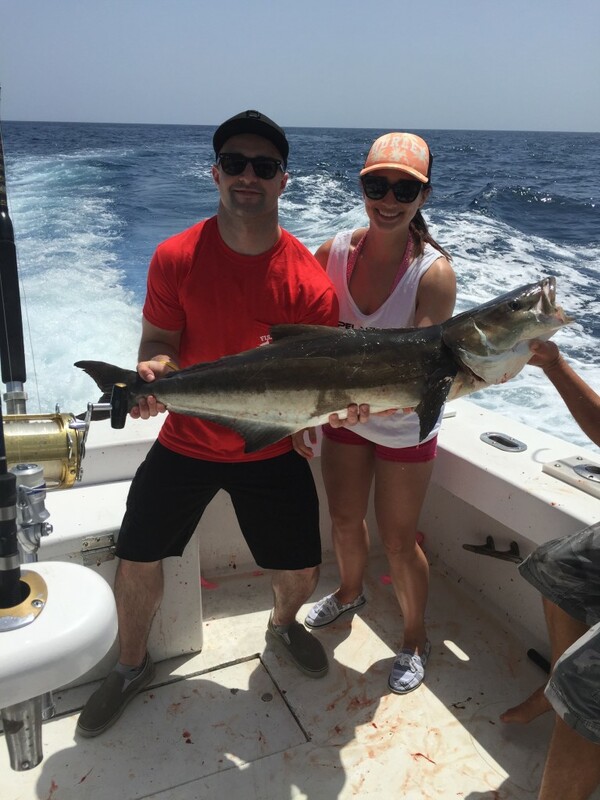 And trolling the reef also gives you a good shot at catching kingfish, bonitos, blackfin tuna and mahi-mahi, all of which are biting now. And let’s not forget our biggest gamefish out there to be caught… sharks. This is our best time of the year for catching big game sharks. Several sharks over 200 pound were caught this week. If you want to go out there and try to catch a fish bigger than you are, shark fishing is for you. This is perhaps the best month of the year to fish Fort Lauderdale as just about everything is biting. This great fishing should continue through May and June, when a new batch of summer fish start showing up. Good luck out there fishing this week. I’ll sea ya on the water.